Yes folks. Santa is a little untidy in the bedroom. Here is the proof. But after all that work delivering toys I suppose we can forgive him for not putting everything away in his Dresser Drawers neatly. hehe. I got my design for this side step card from Jackie Topa. You fold your card in half and cut down to 8.5 cm. Then open the card up and score on right hand side of the card (7cm side) 2cm from the bottom across to the cut and then 4cm from the bottom across to the cut. Fold score lines - Mountain/Valley and then refold card with folds in place. This will mean the 7cm side will have a new top crease line. The original crease line can be hidden with a layer of cardstock. 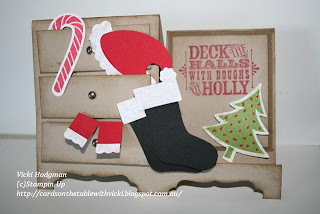 I have used the Scentsational Season Stamp Set and Framelits for the Tree and Candy Cane. Retired Stocking Punch for the boots. Merry and Type Stamp Set for the greeting. Pants hanging out were made with a 1.5cm x 4cm strip of real red card and the end of a scallop square punched in white for the trim. For my workshop on Sunday I made these cute boxes using the Window Frames Framelits page 30 (mini catalogue). And a girly bag to show that it can made a bit more feminine. Here is the tutorial for the box. Remember to click on the photos to get a closer look at them if you wish. You need a piece of cardstock 20cm x 15cm the same colour as your window frames framelits. Score and cut as shown. In portrait position. Score at 3cm and 12cm. In landscape position score at 8.5cm and 11.5cm. Cut on the score lines as indicated. Make up your box. Cut two window frames framelits and trim them as shown. You can emboss them too if you like. 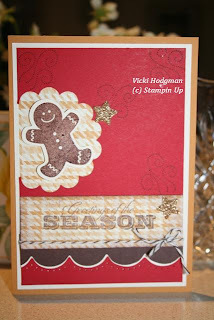 I used the new Lacey Brocade Embossing Folder in the mini page 6. I used the largest Window Frame and yes these are the same size believe it or not! Just a bad camera angle playing tricks with your eyes! hehe. Stick these to the front and back of your box. I lined my box up with the right angles at the bottom of the box. Run Run As Fast As You Can..
Mmmm... Can you smell the Gingerbread Man? 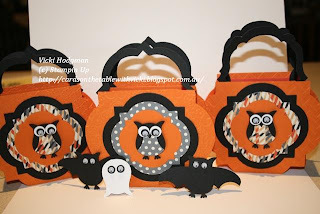 This card idea was from the talented Deb Fearns. My friend Carolyn also made one. A really clever little card. Cardstock was More Mustard,Very Vanilla, Real Red and Chocolate Chip. Can you see what else I used? The Essentials Paper Piercing Pack from the Main Catalogue page 181. This is a "cool tool"! 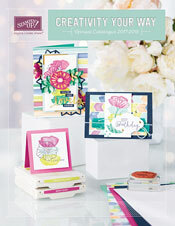 So much fun to use.And there is another pack in the mini catalogue on page 30 too. You get three different templates in each pack and they have heaps of patterns on them. Here are some little card samples I made. This shows you don't even need the actual matching punches/framelits/dies as I have used them just on their own. The heart is my favourite. I recieved the most beautiful gift from my friend Beth on the weekend. When I saw the Hostess Stamp Set "Four Seasons" in the Main Catalogue ( p.199), I knew I had to get it. 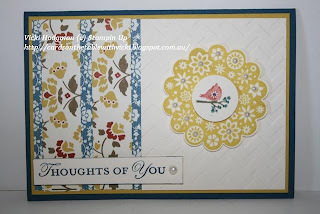 I just love the little birdies and with four seasonal stamps it makes for a versatile stamp set too. I made this card for a friend's birthday last week and then just had to make another I liked it so much. It uses the new designer paper Comfort Cafe. I love the colours in this designer paper. My card uses the Midnight Muse, Summer Starfruit and Very Vanilla cardstock. I stamped the first time in Summer Starfruit and then I cleaned the stamp and just coloured in the centre picture with my Stampin Write Markers and stamped on a separate piece of cardstock. Punched out the first with my 2 3/8" scallop circle punch and then punched out the birdy with my 1" circle and layered on top. This card is going to someone who needs a pick me up for Friendship Friday. I also made another card for next week's class while I had the stamp set out. This week's challenge at Just Add Ink was a colour challenge. I thought the colours might work for a slightly non-traditional Christmas Card. What do you think? I have used the Labels Collection Framelits(p.191). 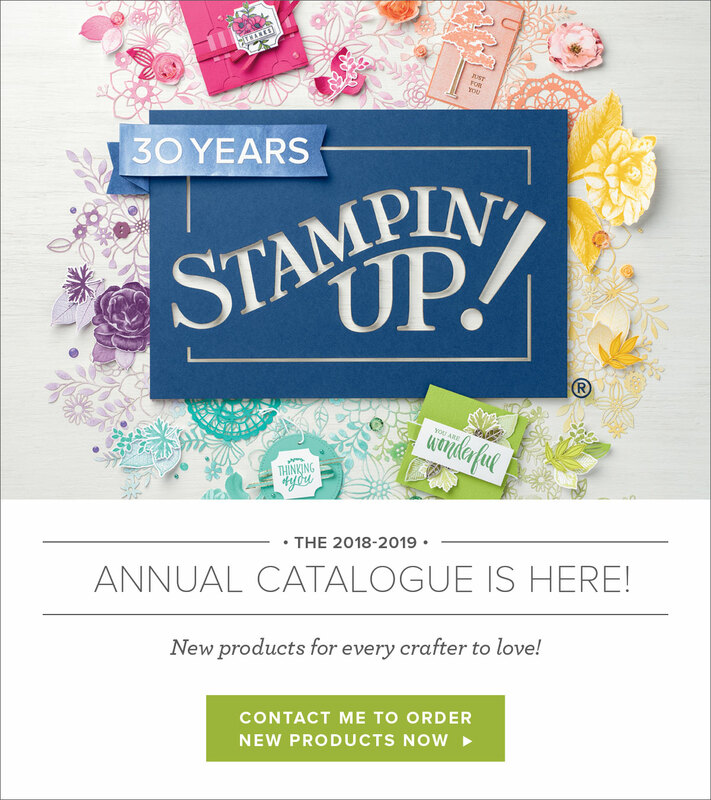 Fancy Fan Embossing Folder(p.189) and the Bells and Boughs Stamp Set in the main catalogue p.20. The designer paper is from the Twitterpated Pack on page.165. And of course my favourite glimmer brads. Gotta love a bit of glimmer in your life! hehe. It is my nephew's birthday this month and he is a huge Lego Fan. 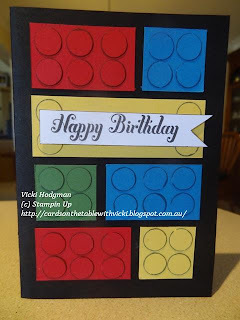 So I couldn't resist making him a Lego Card to go with his Lego present. hehe. This is an easy peasey card to make. I just used primary colours. Turquoise Blue. Garden Green. Daffodil Yellow and Real Red. Layered circles punched from the Itty Bitty Punch Pack. I went round each circle with a black pen to give a shadow effect. The Happy Birthday is from the Perfectly Penned Stamp Set available in the main catalogue.p.132. This weekend we went to Kenilworth for the day. Want to see some pics? It was beautiful weather. We had a picnic by the Mary River. See how dry it is. And we had about 6 of these chaps wanting to help us eat our lunch! Had to keep shooing them away. On the way home we stopped outside of Maleny to admire the view. And met another bird friend. I think she was hurrying home for some dinner and couldn't stop to talk.